Collagen Type VI (COLVI) is an extracellular matrix protein that is upregulated in various solid tumours during tumour progression and has been shown to stimulate proliferation, suppress apoptosis and promote invasion and metastasis. It has also been described as a mediator of chemotherapy resistance and as a therapeutic target in preclinical cancer models. Here, we aimed to analyse the prognostic role of COLVI in salivary gland cancer (SGC). Stromal COLVI protein expression was assessed in primary SGC specimens of 91 patients using immunohistochemistry (IHC). 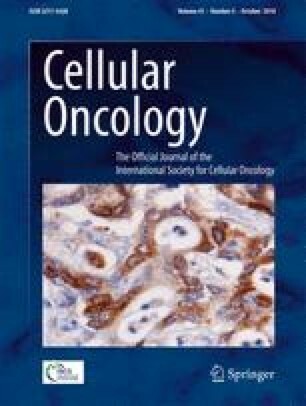 The IHC expression patterns obtained were subsequently correlated with various survival and clinicopathological features, including Ki-67 and p53 expression. We found that COLVI was expressed in all SGC specimens. High expression was found to be associated with features of malignancy such as high histologic grades, advanced and invasive T stages and metastatic lymph node involvement (p < 0.05 for all variables). COLVI expression was also found to correlate with both Ki-67 and p53 expression (p < 0.01). We found that high COLVI expression predicted a significantly inferior 5-year overall survival (38.3%, 55.1% and 93.8%; p = 0.002) and remained a significant predictor of prognosis in a multivariate Cox regression analysis (hazard ratio, 2.62; 95% confidence interval, 1.22–5.61; p = 0.013). In all low-risk subgroups COLVI expression identified patients with an adverse outcome. Patients receiving adjuvant radiotherapy had a poor survival when expressing high levels of COLVI. Our data indicate that stromal COLVI expression associates with key features of malignancy, represents a novel independent prognostic factor and may affect response to radiotherapy in SGC. Although our results warrant validation in an independent cohort, assessing stromal COLVI expression may be suitable for future diagnostic and therapeutic decision making in patients with SGC. The online version of this article ( https://doi.org/10.1007/s13402-018-0389-1) contains supplementary material, which is available to authorized users. This work was supported by the fund “Innovative Medical Research” of the University of Münster Medical School (grants SC211008 (C.S. ), SC111411 (C.S. ), and SC221410 (L.A. and C.S.)). W.E.B. is supported by the Deutsche Forschungsgemeinschaft (DFG EXC 1003, Cluster of excellence “Cells in Motion”).